Thoroughly cleaning gutters in the spring and late fall. Clogged gutters may allow ice to form and back up under the roofline. Making sure proper attic insulation is in place, keeping your house warm, but your attic cool – reducing snow melt on the roof. Ensuring continuous ventilation of attic air, which should be only 5 to 10 degrees warmer than the outside. Make sure heavy ice and snow build-up on your roof is removed. This can cause seepage or even a collapse. 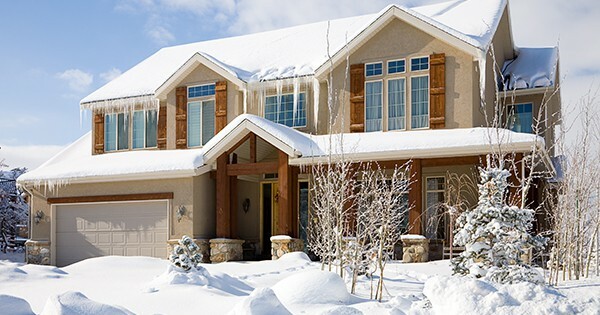 If snow accumulation is significant, hire a professional to “shovel” the roof. Making sure all interior pipes are insulated or have wall insulation around them, especially in vulnerable areas such as attics, crawl spaces and along outside walls. Using weather-resistant insulation to protect exterior pipes. Making sure cabinet doors under sinks are kept open during a heavy freeze to allow heat to circulate around pipes. Hiring a professional to winterize the outdoor sprinkler system and remove all residual water, which can freeze and cause pipes to burst. Disconnecting exterior hoses from their faucets and install frost-free hoses and hose bibs. Clean chimneys and flues on fireplaces and stoves annually. Use a fire screen to control flying embers and burn only seasoned hardwood to reduce the potential for creosote buildup. Place ashes in a metal container and remove from the house immediately. Never put ashes in or near the trash. Service furnaces and boilers at least once a year. Keep portable space heaters at least 3 feet away from flammable objects, such as window treatments, furniture and bedding. Do not use extension cords to power the unit. Make sure your house number is clearly marked in a conspicuous area at the front of the home. Contract a snow removal service that guarantees removing the snow from your driveway after every six inches of accumulation. Place a large marker near a fire hydrant. Clear away surrounding snow.